The over all goal of the research in the Wolfrum lab is elucidating the function of vertebrate sensory cell function. Our studies are aimed to understand the basic cellular mechanisms by which cytoskeletal molecules and protein complexes contribute to the function and viability of sensory cells. 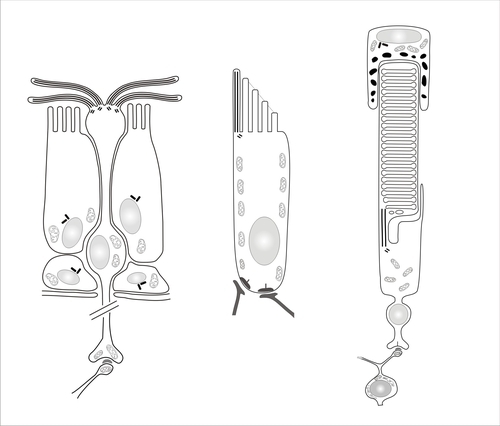 In our research, we focus on ciliated sensory cells: olfactory cells in the nose, hair cells in the inner ear, but predominantly on photoreceptor cells in the retina. The results of these approaches allow us to elucidate mechanisms of retinal degeneration and evaluate gene therapeutic strategies. In our projects, we combine molecular biology with protein biochemistry and cell biology to study sensory cell functions. A main expertise of the lab is high resolution immunocytochemistry by light/fluorescence microscopy, confocal microscopy and electron microscopy, which we use as major analytical tools for our approaches. Analysis of transport complexes in sensory cells. Sensory cells are specialized neurons which display an extraordinary high activity. In rod and cone photoreceptor cells the phototransductive membranes in the outer segments are continually renewed throughout lifetime. For the maintenance of photoreceptor cell function effective and well regulated transport processes are necessary. In cellular systems, intracellular transport processes function in close association with the cytoskeleton. In our lab, we study the cellular function of these transport complexes, e.g. molecular motor proteins (myosin VIIa, cytoplasmic dynein) and ciliary or intraflagellar transport (IFT) molecules as well as the associated structural components in photoreceptor cells. Centrin functions in sensory cells. The small Ca2+-binding centrins belong to the parvalbumin protein superfamily characterized by Ca2+-binding the EF-hand motifs. Centrins are commonly associated with centrioles of centrosomes and related organelles, spindle poles and basal bodies and play an important role in centriole duplication. 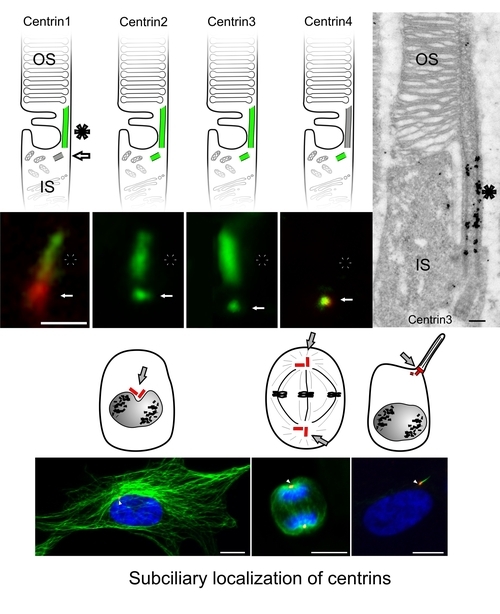 In photoreceptor cells, four known mammalian centrin isoforms (Cen1p to 4p) are differentially localized in the compartments of the ciliary apparatus - the centriole/basal body and the connecting cilium. 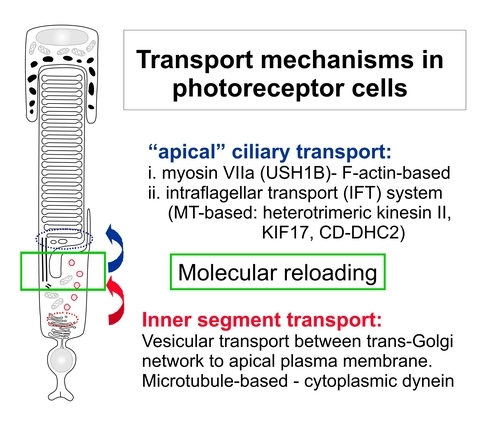 Assembly of centrin/transducin complexes is thought to regulate light-induced translocations of the visual G-protein transducin through the connecting cilium of photoreceptor cells. Deciphering the cellular function of proteins and protein networks related to the human Usher syndrome (USH). The human Usher syndrome (USH) is the most frequent cause of combined deaf-blindness. USH is genetically heterogeneous with at least 12 chromosomal loci assigned to three clinical types, USH1-3. Although these USH types exhibit similar phenotypes in human, the corresponding gene products belong to very different protein classes and families. The main goal of our USH team is to elucidate the functions of USH proteins in the cellular context and to decipher protein networks related to USH - the USH interactome. Current analyses include the role of USH proteins at the connecting cilium, at synapses as well as protein networks associated with intracellular transport in photoreceptor cells. The results elucidate the mechanisms which lead to the cellular defects causing USH. 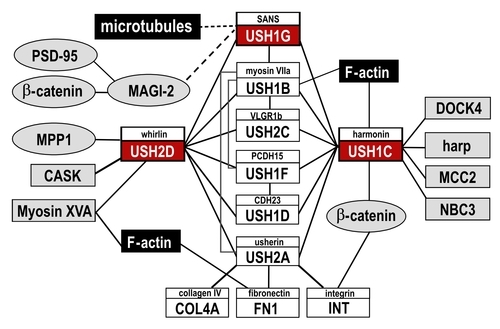 The data obtained in our studies on the cellular functions of USH proteins are necessary prerequisites for founded therapeutic strategies for USH defects, recently introduced in the lab. Evaluation of gene based therapies for the human Usher syndrome in the retina. Based on the findings from our basic research, we recently began to evaluate gene based strategies for the treatment of Usher type 1 phenotype in the retina. For gene addition/replacement of Ush1c/USH1C we apply recombinant adeno-associated viruses (rAAV). As alternatives we evaluate the potential of gene correction through gene targeting by homologous recombination mediated by zinc finger nucleases and suppression of nonsense mutations by aminoglycosides, which allow emendation of the mutation in situ. For most of our projects recent reviews are available which are indicated in the list of publications. Our projects are embedded in international collaborations as well as in scientific networks at the Johannes Gutenberg University of Mainz.